Lavish Polish - Scouts Unite Collection - Polish Etc. "Princess of the Moon" is a Barbie pink crelly packed with fine holographic microglitter and shimmer. This color was inspired by Sailor Moon herself and the colors of her transformation wand. The formula was wonderful which is exactly what I have come to expect from Lavish polish. I did two easy coats with a glossy top coat for this mani. I wore it all day and got a few compliments on the color. "Guardian of Fire" is a bright red jelly polish loaded with tiny red glitters, holographic shimmer and some fine bright blue flakies. This polish is inspired but Sailor Mars. I love the shimmer floating in this jelly! I used two smooth coats topped with a glossy top coat. So pretty! "Guardian of Thunder" is a forest green jelly packed with holographic glitter and shimmer. Sailor Jupiter is the inspiration behind this polish. I used two easy coats with glossy top coat. There is lots of depth in this deep color. I can see this being a perfect polish for Christmas! "Guardian of Water" is a light blue and silver holographic microglitter in a clear base. This shade was inspired by Sailor Mercury. I did two coats alone with a top coat but you could also do one coat over a base color for a nice sparkly top coat. Dainty and sparkly! "Guardian of Love" is an orange and gold holographic microglitter in a clear base. Oh man to I love this one. I am such a sucker for orange polishes. This glitter was inspired by Sailor Venus. It, too, can be used as a topper or can get opaque in 2-3 coats. I used two coats with a glossy top coat. This glitter is going to be perfect for fall. 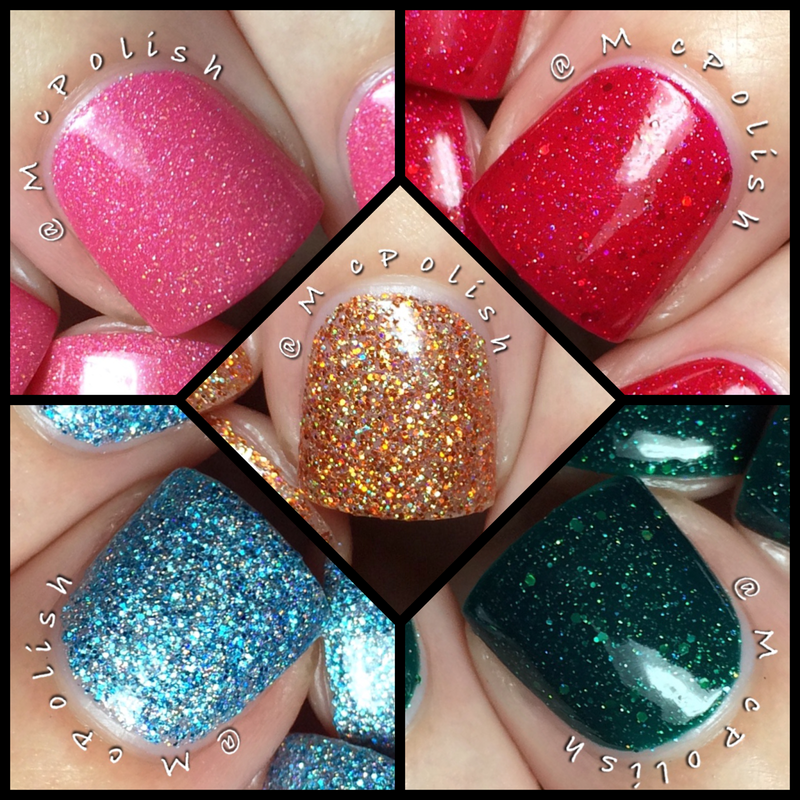 Like I said earlier, this collection is available now from Lavish Polish's online store. I think all of these polishes are totally worth getting. My have is definitely Guardian of Love. Which is your fave? Here is where you can keep up to date with Lavish Polish. Awesome! :) Especially the pink one!